While making the commitment to the cloud of your choice is half the battle, there are still a few major decisions organizations have to make. The two that take precedence are choosing your cloud platform and selecting your vendor, but what exactly should your company be looking for? A traditional Platform-as-a-Service stack includes the storage, networking, servers, operating system, middleware, and the virtualized/container-based environment. All in all, the PaaS provides businesses with everything required for the hosting of its data and applications. So the question then becomes, which factors of the private cloud platform warrant the greatest consideration? Regulations and legislation, particularly where data is concerned, largely depends on the geographic location of the company. Therefore, the private cloud services could potentially span geographies, thus requiring the platform it is built on to manage these variations. This is where policy-based automation can potentially step in and mitigate any resulting issues. Most, if not all, businesses are based on policies, processes, and transactions. Automation fits in by efficiently and accurately translating these operational elements into actions that support them. Automation is typically achieved through a framework that takes into account resource provisioning, cloud environment monitoring and management, and reporting on areas like billing and resource lifecycle management. The single, most critical automated function within the private cloud has to do with the identification and authentication of users. Should a user request services, the system is responsible for ensuring that they are in fact authorized to make the request in question. If they are, the automation then uses a workflow engine to obtain authorizations, locate and provision resources, and balance workloads to optimize performance. Automation can also play a significant role in the adherence to both business policy and regulatory requirements by handling tasks in a uniform, predictable, and policy-based way. The concept of data encryption as a method of ensuring its security isn’t new. That being said, the processor overhead involved where public cloud vendors are concerned sometimes limits the extent to which they will cover a customer’s database and everything in it. There’s also the issues of understanding the encryption policies of a public cloud provider, and whether they have the capacity to cover all of an organization’s needs. Additionally, due to the fact that private clouds are a growing part of the hybrid cloud scenario, it is becoming significantly more important to manage encryption on the enterprise side. For private clouds, virtualization has become a must-have in order to deliver on the flexibility and cost benefits of cloud deployment. In fact, most companies are in the market for hyper-converged platforms when it comes to the foundation for their private clouds as they include compute, storage, and virtualization capabilities. Hyper-converged platforms are also a solid choice for organizations that, while having a decent investment in virtualization, are having difficulty with data protection, storage complexity and its cost. For those companies that have selected a private cloud, opting for a hyper-converged platform can mitigate some of the complexity involved with managing a less integrated infrastructure, enabling them to focus more on the business aspects of their IT. 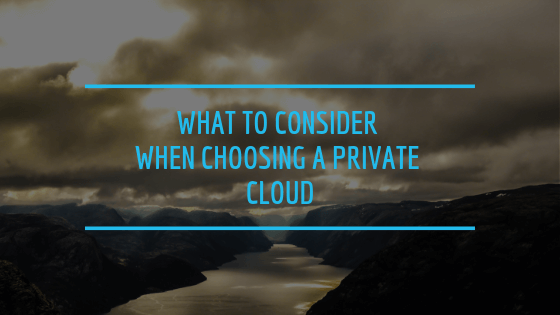 Taking these considerations into account, it’s easy to see how choosing the right private cloud platform vendor is crucial to an organization’s success. Over time, requirements will undoubtedly change, and it will necessary for the company’s private cloud to adapt. This may result in transitioning your private cloud to be a part of a hybrid cloud or adapting to new application or workload requirements. This is where managed service providers like VEXXHOST can add a lot of value. By providing extensive services that range from configuration management to hardened security, we can take away the stress of managing IT infrastructure and assets, which can reduce costs while freeing up company resources to focus more on the business. VEXXHOST also works closely with our clients to understand their business, and is able to effectively map our services to businesses goals and practices. Should companies be unsure as to what their needs are or how to efficiently reach their goals, VEXXHOST can share our expertise through consultation. Contact us today to get started!